Professor D’Mello is currently a Professor of Structural Engineering at City University London. He obtained his undergraduate and doctoral degrees in Structural Engineering from the University of Sussex. His research work is largely in the area of very large scale testing, both in the laboratory and on location on oil rigs and large office buildings. The main focus is on composite structures, starting initially with grouted connections in offshore structures and currently on long span composite floors in buildings. All of the research work has been linked to industrial need and much of it has been supported by UK and European funding bodies and by industry. A further area of research has been in the area of dynamics of structures, particularly on the dynamics of long span floors. Professor D’Mello’s current research activity is on long span floors and particularly on the ultra slim floor beam, in which the floor slab is incorporated within the beam depth. Professor D'Mello has held a number of senior appointments in the School and the University. 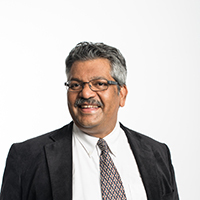 He was the Associate Dean Education from 2009 to 2014, having previously been Head of Civil Engineering and later the Associate Dean Learning and Teaching in the School of Engineering and Mathematical Sciences. His role was to lead the strategic direction of education matters in the School and promote a positive learning and teaching environment. He was an elected member of University Senate until 2013. Professor D’Mello’s research work is largely in the area of very large scale testing, both in the laboratory and on location on oil rigs and large office buildings. The main focus is on composite structures, starting initially with grouted connections in offshore structures and currently on long span composite floors in buildings. All of the research work has been linked to industrial need and much of it has been supported by UK and European funding bodies and by industry. A further area of research has been in the area of dynamics of structures, particularly on the dynamics of long span floors. A major part of Professor D’Mello’s current research activity is on long span floors and particularly on the ultra slim floor beam, in which the floor slab is incorporated within the beam depth. Further research work on innovative opening shapes is also in progress and several papers have been published on these topics. He has also filed a patent on this work. The work on composite cellular beam floors also includes the dynamic behaviour of flooring systems and several reports on actual floors have been written. All of this work has been supported by industry. With the incorporation of the beam and services within the slab thickness and the resulting significant reduction in floor heights, the results of this research work will have a very large impact on building costs and sustainable construction. In addition to the experimental work, Professor D’Mello has several projects involving numerical analysis. The work started with the FE analysis of ship structures and further numerical research work on fatigue of FPSOs was carried out through his PhD student. The current research investigating the behaviour of web opening shapes includes comprehensive FE analysis and parametric studies. D'Mello, C. and Boswell L F, (1995). The Jack-Up Platform. Bentham Press, London. ISBN 1-874612-22-6. D'Mello, C. and Boswell, L F, (1993). Dynamics of Structural Systems. Blackwell Scientific Publications. ISBN 0-632-02199-3. D'Mello, C. and Boswell, L F, (1990). The Jack-ups Drilling Platform, Design, Construction and Operation. Elsevier Applied Science. ISBN 1-85166-490-4. Ghezelbashan, A. and D'Mello, C. (2018). Assessment of the hydrodynamic forces for equivalent modelling of jack-up legs. Ghezelbashan, A. and D'Mello, C. (2017). Wave loading on a flexible offshore structure. (2013). Proceedings of the International Conference The Jack-Up Platform – Design, Construction and Operation. International Conference The Jack-Up Platform – Design, Construction and Operation. D'Mello, C. and Tsavdaridis, K.D., (2011). FE Modelling Techniques for Complex Web-Post Buckling Response of Perforated Steel Beams with Closely Spaced Web Openings of Various Shapes. 6th European Conference on Steel and Composite Structures August, Budapest, Hungary. (2011). Proceedings of the International Conference The Jack-Up Platform – Design, Construction and Operation. International Conference The Jack-Up Platform – Design, Construction and Operation. D'Mello, C., Yu Huo, B, and Tsavdaridis, K.D., (2010). Experimental study and Finite Element Analysis of Innovative Shear Connectors of Ultra Shallow Floor Beam. 34th IABSE Symposium 22-24 September, Venice, Italy. Yan, S., Ma, Q.W., D'Mello, C. and Zhang, L. (2010). Numerical investigation of fully nonlinear interaction between freak waves and 2-D submerged cylinders. Ma, Q., Yan, S., D'Mello, C. and Zhang, L. (2010). Numerical Investigation of Fully Nonlinear Interaction between Freak Waves and 2-D Submerged Cylinders. Conference/Proceeding of ISOPE 2009. Huo, B.Y., D'mello, C. and Tsavdaridis, K.D. (2010). Experimental and analytical study of push-out shear tests in ultra shallow floor beams. Tsavdaridis K. D, and D'Mello, C. (2009). Finite Element Investigation of Perforated Steel Beams with Different Web Opening Configurations. 6th International Conference on Advances in Steel Structures 16-18 December, Hong Kong, China. D'Mello, C., Tsavdaridis, K.D, and Yu Huo, B, (2009). Experimental study of ultra-shallow floor beams with perforated steel sections. 16th Concrete Conference 21-23 October, Paphos Cyprus. D'Mello, C., Tsavdaridis, K.D, and Hawes, M, (2009). Experimental study of ultra-shallow floor beams with perforated steel sections. 11th Nordic Steel Construction Conference 2-4 September, Malmö Sweden. (2005). Proceedings of the International Conference The Jack-Up Platform – Design, Construction and Operation. International Conference The Jack-Up Platform – Design, Construction and Operation. (2003). Proceedings of the International Conference The Jack-Up Platform – Design, Construction and Operation. International Conference The Jack-Up Platform – Design, Construction and Operation. Gebremichael, Y.M., Li, W., Meggitt, B.T., Boyle, W.J.O., McKinley, B., Grattan, K.T.V. … Kvenild, L. (2001). Bragg grating based multi-sensor system for structural integrity monitoring of a large civil engineering structure: A road bridge in Norway. D'Mello, C., Gebremichael, Y.M, , McKinley, B, and et al., (2001). Comparative field study of fibre Bragg grating strain sensors and foil gauges for structural integrity monitoring. D'Mello, C., Wade, S.A., Grattan, K.T.V., Sun, T., Leng, J., Fernando, G.F. … Boswell, L. (2001). Applications of Optical Fibre Temperature and Strain Sensors for Structural Integrity Monitoring. Australian Conference on Optics, Lasers and Spectroscopy Australia. (2001). Proceedings of the International Conference The Jack-Up Platform – Design, Construction and Operation. International Conference The Jack-Up Platform – Design, Construction and Operation. D'Mello, C. and Boswell, L.F. (1999). The use of grout for the repair and strengthening of steel tubular members. D'Mello, C., Boswell L F, , Morris W, , Hancock M, and Bond I, (1996). Static Testing of Full Scale Turbine Blades up to 21m Long. Goteburg, Sweden. D'Mello, C., Boswell L F, , Morris W, and Jones W, (1993). Some Experiences of Fatigue and Static Testing of Full Scale Windmill Blades. European Union Wind Energy Conference Germany. D'Mello, C. (1987). Stability and Dynamic Analysis of Offshore Structures. Academy of Sciences Seminar Yugoslavy. D'Mello, C. and Morrell, P J B, (1986). Moment Shear Interaction of Hollow Section Steel Beams. Steel Structures conference Dubrovnik, Yugoslavia. D'Mello, C. and Boswell, L F, (1984). Model Analysis of Grouted Connections For Use In Construction and Repair of Offshore Structures. Institute of Structural Engineers Seminar. Huo, B.Y. and D'Mello, C.A. (2017). Shear Transferring Mechanisms in a Composite Shallow Cellular Floor Beam with Web Openings. Structures, 9, pp. 134–146. doi:10.1016/j.istruc.2016.11.003 . Tsavdaridis, K.D., D'Mello, C. and Huo, B.Y. (2013). Experimental and computational study of the vertical shear behaviour of partially encased perforated steel beams. Engineering Structures, 56, pp. 805–822. doi:10.1016/j.engstruct.2013.04.025 . D'Mello, C. and Yu Huo, B, (2013). Push-out Tests and Analytical Study of Shear Transferring Mechanisms in Composite Shallow Cellular Floor Beams. Journal of Constructional Steel Research 88 (2013) 191–205. Tsavdaridis, K.D. and D'Mello, C. (2012). Vierendeel bending study of perforated steel beams with various novel web opening shapes through nonlinear finite-element analyses. Journal of Structural Engineering (United States), 138(10), pp. 1214–1230. doi:10.1061/(ASCE)ST.1943-541X.0000562 . Tsavdaridis, K.D. and D'Mello, C. (2012). Optimisation of Novel Elliptically-Based Web Opening Shapes of Perforated Steel Beams. The Journal Construction Steel Research, 76, pp. 39–53. Tsavdaridis, K.D. and D'Mello, C. (2012). Vierendeel Bending Study of Perforated Steel Beams with Various Novel Web Opening Shapes, through Non-linear Finite Element Analyses. Journal of Structural Engineering American Society of Civil Engineers. Hamadi, D., Ounis, A. and D'Mello, C.A. (2011). Efficiency of the strain based approach compared to the displacement formulation for the analysis of structures. Proceedings of the World Congress on Engineering 2011, WCE 2011, 1, pp. 57–62. Tsavdaridis, K.D. and D'Mello, C. (2011). Web buckling study of the behaviour and strength of perforated steel beams with different novel web opening shapes. Journal of Constructional Steel Research, 67(10), pp. 1605–1620. doi:10.1016/j.jcsr.2011.04.004 . Tsavdaridis, K.D. and D'Mello, C. (2011). Web buckling study of the behaviour and strength of perforated steel beams with different novel web opening shapes. Journal of Constructional Steel Research, 67(10). D'Mello, C. and Venghiac, V-M, (2010). The Influence of the Thickness of the Slab and Concrete Grade on Composite Slabs. Bulletin of the Polytechnic Institute of Iasi LVI (LX)- Construction & Architecture Section, 2. D'Mello, C., McKinley, B. and Boswell, L.F. (2004). Jack-up platforms. Marine Structures Journal Special Issue, 17(3-4), pp. 163–163. doi:10.1016/j.marstruc.2004.08.001 . D'Mello, C., McKinley, B. and Boswell, L.F. (2004). Editorial. Marine Structures, 17(3-4), p. 163. doi:10.1016/j.marstruc.2004.08.001 . Wade, S.A., Grattan, K.T.V., McKinley, B., Boswell, L.F. and D'Mello, C. (2004). Incorporation of Fiber-Optic Sensors in Concrete Specimens: Testing and Evaluation. IEEE Sensors Journal, 4(1), pp. 127–134. doi:10.1109/JSEN.2003.820352 . D'Mello, C.A., McKinley, B. and Boswell, L.F. (2004). Special Issue of Marine Structures Journal. Marine Structures. D'Mello, C., Wade, S.A., McKinley, B., Grattan, K.T.V. and Boswell, L.F. (2003). Incorporation of Fibre Optic Temperature And Strain Sensors In Concrete Specimens: Testing And Evaluation. IEEE Sensors Journal. D'Mello, C., Boswell, L F, and Etube L, (2001). Jack-up platforms. Marine Structures Journal Special Issue. D'Mello, C., Boswell L F, and Etube L, (1999). The Jack-Up Platform. .
D'Mello, C. and Boswell, L.F. (1999). Use of grout for the repair and strengthening of steel tubular members. Proceedings of the International Offshore and Polar Engineering Conference, 4, pp. 30–37. et al., (1998). 'Jack-up platforms'. Marine Structures Journal Special Issue. et al., (1996). 'Jack-up platforms'. Marine Structures Journal Special Issue. Boswell, L.F. and D'Mello, C. (1992). Recent developments in jack-up platforms: design, construction and operation. Recent developments in jack-up platforms: design, construction and operation. Boswell, L.F. and D'Mello, C. (1992). Recent developments in jack-up platforms: design, construction and operation. .
D'Mello, C. and Boswell, L F, (1989). 'The jack up platform'. Marine Structures Journal Special Issue. Boswell, L.F. and D'Mello, C. (1986). The fatigue strength of grouted repaired tubular members. IN: OTC '86 PROC. EIGHTEENTH ANNUAL OFFSHORE TECHNOL. CONF., (HOUSTON, U.S.A.: MAY 5-8, 1986), 4 , Richardson, U.S.A., Offshore Technol. Conf., 1986, Paper OTC 5307, pp. 147–152. Boswell, L.F. and D'Mello, C. (1985). EXPERIMENTAL BEHAVIOUR OF GROUTED CONNECTIONS FOR CONSTRUCTION AND REPAIR. pp. 835–844. Boswell, L.F. and D'Mello, C. (1985). The experimental behaviour of grouted connections for construction and repair. IN: BEHAVIOUR OF OFFSHORE STRUCTURES, PROC. 4TH INT. CONF. BOSS '85, (DELFT, THE NETHERLANDS: JUL. 1-5, 1985), J.A. BATTJES (, 2 ) (ISBN 0-444-42513-6), pp. 835–844. D'Mello, C. and Boswell, L F, (1990). Residual and Fatigue Strength of Grout Filled Damaged Tubular Members..